Today‘s world economy is undergoing extraordinary changes. One often hears of the ground-breaking progress that is happening in the fields of IT and data analytics – most commonly known as digitalisation – and the different ways it affects customers and almost all industry sectors. Whether using supercomputers to analyse the complexities of different genomes or to revolutionise supply chain management, the result of digitalisation is the same: highly efficient, streamlined distribution channels. Focusing on the insurance industry and underwriting specifically, we see a potential for transformative change in how things are done. Either through online application processes and simplified underwriting, or by more advanced data analysis – using, for example, facial recognition – the underwriting process is going to change. What the exact developments will be and how they finally affect our industry is not yet 100% clear. But as millennials ourselves, we do know that simply hiring a social media manager is not sufficient. Taking digitalisation seriously and crafting a comprehensive strategy is the first step in adapting to a new digital environment focused on the customer. While the jury is still out on what the most effective sources of data will be for underwriting in the future, these new sources will require a lot of processing power to sift through and draw a conclusion from the data. 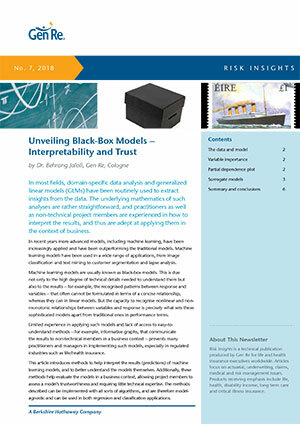 While biometric underwriting will most likely never be replaced, other sources with appropriate models and inputs will become increasingly useful for assessing and predicting risk. This will also increase the need for data analysts to assist in underwriting. Big data and digitalisation can’t bring a benefit if data are incomplete. One of the hurdles is to create customer trust. Without that trust, it will not be possible to show customers how sharing their data ends up as a net benefit for them. One of the first tasks is therefore establishing and using customer relationships in order to facilitate the necessary data sharing. While data sharing elicits some angst in the clients, it is a win-win situation for insurers and customers if done properly. Successful underwriting involves straightforward application forms and questionnaires aimed at increasing the utilisation of data through improved efficiency. Insurers should follow a golden rule when crafting assisted and targeted (smart) underwriting forms: every step of the process and each question that an applicant goes through should create evaluable data points that can form the basis for future product development. In short, application forms need to be drafted in such a way that a computer can process and analyse them. It has the additional benefit of saving time, resources and (perhaps most importantly) applicant frustration. Medical and biological science enable us to cure diseases and better understand our lives. One of the most basic aspects of this search for understanding is our genome and our attempts to decode and utilise its information. First starting in the 1970s, we reached a major milestone via the human genome project, which decoded human DNA. Today, what once took years, millions of genes are sequenced in an unbelievably short amount of time. The same evolution in IT and storage technologies – which enabled us to turn genome sequencing from a multimillion-dollar, years-long process into something that can be done in a few hours for a few hundred dollars – will also allow doctors to better diagnose and heal diseases. Via data analytics, improved, more targeted products can be created that respond to customer needs by utilising this information. Therefore, techniques need to be developed to analyse these diagnoses on a large scale. This is especially important as measures such as cheaper genome sequencing can allow clients to know more about their own health than the insurer and potentially increase anti-selection. Nevertheless, we are aware that the legislation in various countries still faces challenges regarding the use of genetic information. Incorporation of social media into underwriting processes could be an opportunity to rethink how we assess insurance applications. For some risks, no lab tests exist to tell you if an applicant is in the danger zone. The classic example is mental health, which can be difficult to detect at the underwriting stage and is particularly impactful at the claims stage. By going beyond doctor reports, and making use of personal information that many times already exists on social media, data analysis can provide indicators that (in combination with other parts of an applicant’s medical file) can predict potential mental health issues. As an example, in a recent study, the Instagram feeds of study participants were analysed with machine learning and the researchers were able to identify markers for depression.3 As social media, GPS, and health data from our mobile phones and other online information become ever more present in our daily lives, using this information from digital spheres and connecting the dots to potential risks will become more and more important. Other new technologies – such as facial and voice recognition – will create new opportunities to mine data from social media, which in combination with identifying purchasing habits can open new sales possibilities. It could also be something as simple as analysing the other policies an applicant has. For example, one insurer recently was able to determine that its clients, who had life insurance policies, were lower risks when it came to insuring their automobiles.4 Similar sorts of data analysis could provide other insights into the risk a group or individual presents. Still, caution should be exercised to guard this information; data protection, privacy, and cybersecurity will be the keys to achieving an enhanced underwriting process. Before the power of data analytics can be put to work, you need the correct parameters and information regarding the data that will be analysed. While laws, regulations, and systems already deal with medical data, the kind of personal information needed to go beyond biometrical underwriting is less regulated, and many times requires client consent to obtain it. Clients will need to provide access to social media accounts, purchasing habits, location information, and other sources that will become more relevant (and prevalent) as time passes and more significant connections are established. That means the next big hurdle after creating a data analytics/digitalisation system is gaining clients’ trust in order to receive access to their data. In order to counteract the reluctance of customers in certain regions to share this data, insurers have to rethink their approach to rebuilding client trust. The first two most effective steps are ensuring the strength of the insurers’ data protection and security policies, and secondly, the development of guidelines for data privacy that are the cornerstone of insurance operations. Increasing customer awareness of these practices is vital to maintaining trust. Previous failures in these areas across a number of industries (not specific to insurance) demonstrate the need to prioritise the rebuilding of customer trust. Plenty of examples demonstrate this lack of trust. Gen Re’s article “The Future of Insurance” reported that a Deloitte study found only 50% of people were willing to share their health data with their insurers.6,7 A 2015 study by Accenture found that the majority of consumers in Western Europe were not confident that their personal information is secure on the Internet and 90% of all consumers have concerns regarding the security of their online financial transactions.8,9 To adequately deal with the issue of trust, we looked at the root cause and identified two major points worth sharing. The reputation problem of the insurance industry is a global issue that is most acute in mature markets. Ernst & Young‘s 2014 Global Insurance Survey found that levels of trust in the insurance sector are consistently ranked below most others, with the lowest results in Europe and Australia. The insurance sector is joined at the bottom with pharmaceutical companies.10 This is especially worrisome as both sectors are dealing with one of the most essential issues for people – their life. Furthermore, especially in the life insurance sector, many long-term customers are afraid that their policies will be sold on, which runs contrary to their belief that their contract with their insurer is a deal made for a lifetime. Especially in traditional markets, customers tend to assume their contract to be a mutual promise of loyalty – a bond sometimes perceived as strong as marriage. Client fears of improper data storage and use are not unfounded. The reasons for it can be seen splashed across headlines and on our television screens. In 2017, due to lapses in its IT security, the credit reporting agency Equifax suffered a data breach where sensitive personal information for 140+ million people was stolen by hackers.12 This is just one of many hacks or leaks in the recent news where improperly secured customer data fell into the hands of hackers or the highest bidder on the dark web. In many ways, insurers are already ahead of the curve as we have been handling clients’ sensitive medical records for decades now. However, in order to maintain the trust we have established in this area, ensuring the security of customer data is paramount in the digital age. To our knowledge, a state-sponsored model has not gone past the policy proposal stage in any country, but private companies in some countries have already implemented several social credit-like scoring systems that go beyond existing systems that are already established around the world. The scoring is not limited to financial services; it can determine the conditions of your car rental or the kind of train tickets you can book. It has even been used as part of airport security, rewarding those with high credit scores with express security screening.14 Barring regulatory interference, it is only a matter of time before insurance companies will make use of these data perhaps in combination with full electronic medical records. For insurers, this suggests that while collecting personal information on customers is important for fully realising the benefits of data analytics, it is important that it be structured in such a way that clients experience a net benefit from doing so and do not become frightened of being too transparent. Of course, we are still a long way from living in such a society, but these portrayals in film and TV give insight into what people and societies fear could happen in a system where everything is determined by an algorithm and a few data points, over which you have little control. While Gen Re is not looking to create an all-encompassing social score to assist with underwriting, we have already established a digital strategy. Knowing more about an applicant in the right context can help evaluate their risk. In our quest to make the most out of digitalisation, we cannot rest on our laurels and waste time before developing a digital data processing operation. Non-traditional actors are already looking into entering the industry, going beyond start-ups and using technologies and systems that have not previously been applied to this industry. These companies have enormous financial resources, existing data analytics expertise, and a vast wealth of customer data at their fingertips. Not having a digital strategy and a plan for how to acquire and use potential sources of personal data is not an option; the insurance industry can and should take part in controlling and setting guidelines and standards for the future within each market’s respective regulatory framework. Even though customers may have only general fears regarding sharing data with companies, it is important for insurers to build trust with customers, which will allow better access to non-biometric information that will be useful to underwriting in the future. Gen Re is already involved in a number of insurtech start-ups and initiatives, working on how to utilise emerging digital technologies for the life/health insurance industry. We are ready to help your organisation with customised solutions that fit your market and business – whether it is working on the future of blockchain, providing innovative tech-based health care solutions, or developing new ways of selling insurance and customer outreach. It is important to stay open; digitalisation could still take a lot of paths in the insurance sector. It is too early to tell if the hype behind any one technology or system will result in concrete changes for underwriting. Being open and agile with the ability to respond to the best source of data is the best way forward. As new standards emerge, having the infrastructure and ability to adapt will be key to making the most out of digitalisation. In the end, whatever the digital future holds, transforming your business by solidifying the trust your clients have in you – and engaging them in all the facets of their lives – will give your company the ability and agility to respond to market changes and developments, whatever and wherever they may come from or lead to, while at the same time enabling you to more easily take your customers along with you. For more perspective on how technology is changing insurance, listen to our Digital Dialogues podcast series. 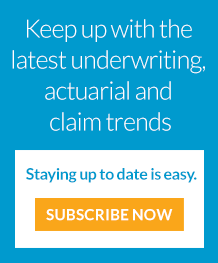 This client-only publication provides Life/Health underwriters in Europe and Asia with information about general aspects and new tendencies in underwriting. It's published semiannually and focuses on medical and non-medical topics along with detailed case samples. In addition, each issue contains a "look across the fence" at underwriting practices in other countries.